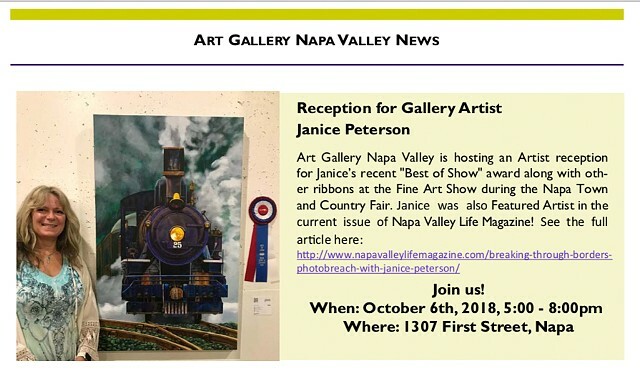 The Art Gallery Napa Valley is hosting an Artist reception for me because of my recent "Best of Show" award along with other ribbons at the Fine Art Show during the Napa Town and Country Fair and also because of the Featured Artist in the Napa Valley Life Magazine! I have been honored with a revealing article about me in the Napa Valley Life Magazine thanks to Janna Waldinger! I will have a booth this year at the Apple Harvest Festival! I will be participating in the Napa Open Studios! 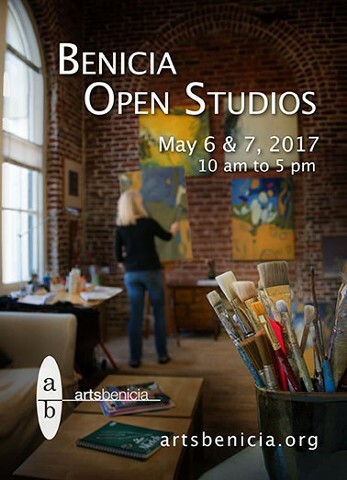 This year I will have a studio during the Benicia Open Studios! Look for my booth at this all day event in downtown Yountville! The first fine art gallery to exhibit my art work! A photo book depicting images of my art work inspired by McCloud and portrayed with moments of my thoughts, processes and notions. Art talk to begin at 6:30 p.m.
Janice Peterson as the featured artist! Gene Eagle interviewed me during my art show in McCloud last July, 2011 and wrote this nice article in the local Mount Shasta Area Newspaper. The archive only gave access to the text and not the photo. Gene wrote a misquote at the end which should have said "I 'hope' to have an art show in Benicia 'soon'." Artist Janice Peterson is holding her first Art Show through July 10 at the McCloud Mercantile Building in the upstairs "Great Room." Inspired by the beautiful setting of Mt. Shasta and the town of McCloud, Peterson expresses her love for the mountains and the wildlife using acrylic paint on canvas in lifelike detail. Born and raised in Redding, she spent many summer months while growing up camping in the Mt. Shasta Wilderness area. Her father, an avid outdoorsman, climbed the mountain 4-5 times, flew gliders out of Weed, skied, and hiked. Peterson said her father owned a print shop and she studied in graphic arts from him; that's when she started doing fantasy artwork. "Then I began developing skills into more wildlife and landscape," she said. "I did more wolves and landscapes and I've been going to school for about ten years." "I did a series of McCloud paintings which I just completed, and that's what this show is about." Peterson said it takes her longer to do her pieces because she is detailed and her work is realistic. For her "McCloud Series," she uses a lot of red in the Squaw Valley Riding Club's horse barns. The realism and detail puts you on scene, with a genuine sense of being able to reach out and touch them. "I love those quaint little red barns," she said. Peterson said she sees that a lot of McCloud history is slipping away and is trying to capture as much as she can on canvas. "Losing the Dinner Train was so sad," she said She will be doing her 2nd art show in Benicia, California, next week. Copyright 2011 Mt. Shasta Herald. All Rights Reserved.